Step 8. 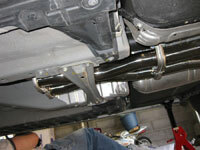 Install the crossover pipe to the mid-pipes. 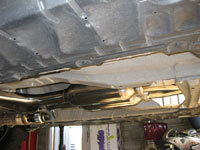 use two supplied nuts and bolts with a gasket to affix each mid-pipe to the crossover pipe. Leave the nuts loose for now. At this time, reinstall the cross brace that was "removed" in step 4. Step 10. The final step is to install the two tips. 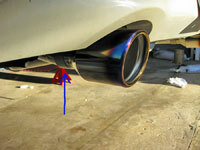 Slide the flange and the tip over each exhaust pipe. You can take this time to adjust the tips to make sure they are positioned evenly with the bumper and not twisted. Using a 17mm socket, tighten the flange to secure the tips. I made sure the flange bolt was near the top for a clean look. Testing. At this point, crank the vehicle and check for leaks. In most cases you can look for drops coming from the gasket connections dependant on the humidity. We actually had to adjust some of the connections to ensure a proper fit. We did have one that would drip somewhat regardless of what we did. After the road test the connection sealed itself and no longer dripped water. Take your time. When you are happy with the test the car can be removed from the jack stands. NOTE: After a test drive the car will smoke. After the first test drive there was enough smoke coming from the exhaust to look like a blown head gasket. Never fear, it will go away after the exhaust burns off manufacturing residue that is left behind from the manufacturing process. Enjoy your exhaust!